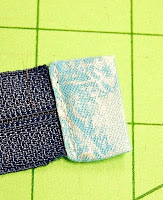 Putting in a zipper is not that hard, especially when using the BERNINA #14 zipper foot with guide. Don't have a BERNINA? Grab that zipper foot and get busy! Just made a quick triangular cosmetic or "anything" holder and adding a covered end to the zipper just gives it a little something extra. Cut about a 2 inch square. Measure the zipper width. 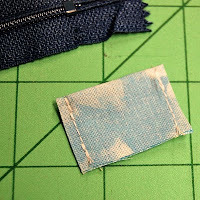 Fold the square right sides together, and mark the zipper width. To the sewing machine and with a regular presser foot, sew the two sides. Turn to the right side and be sure to make those corners nice and sharp! 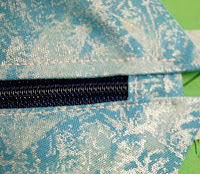 Slide onto the end of the zipper and topstitch. 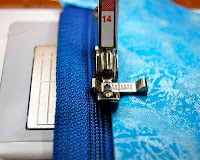 If using a plastic coil zipper, sewing is much easier but still watch out for any metal to break that needle! Attach BERNINA #14 zipper foot. Sew the zipper as usual. This is where the BERNINA #14 zipper foot with guide is so helpful! Either place the tiny groove to the left of the foot over the coil teeth or not, depending on how close you are sewing to the coils. That's it! You have covered the zipper end and just added a little professionalism to your zippered pouch. Think I will toss in some make-up and brushes! Don't forget to find us on FACEBOOK for sharing and quick tips. Many sewing items to suit your needs! I like this accessory, the zipper foot with guide. Do you know if there is one that can fit my Bernina 730 Record ("old style")? 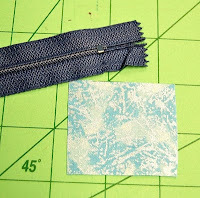 I am not sure if there is an "original" BERNINA old style - just now learning all the older style feet BUT I know a generic can be purchased and it is the zipper with guide #14 for old style. We will actually have those in our online store in several weeks, but right now a search on the internet could turn one up. Just be sure they specify "older style". I do LOVE this foot! I like the neat zipper end, so simple, even without a Bernina. I like the neat zipper end, so simple with a tailored look.